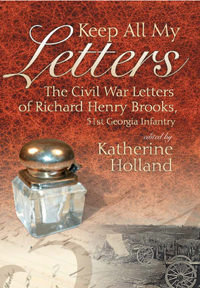 In May 1862, Richard Henry Brooks of Blakely, Georgia, enlisted in the Confederate Army for the duration of the war, serving in Longstreet’s Corps. He would see his wife and family only once in the next three years. He would suffer hardship and deprivation, become hospitalized, participate in one of the grandest Confederate victories of the war, and be captured and held prisoner for almost a year. He wrote his wife Telitha regularly. He told her repeatedly to save all his letters, which she did, and they are published in this book. These letters give considerable insight into Confederate homelife in southwest Georgia during the war. Brooks gives Telitha advice on the daily details of running the household. He tells her who to go to for help, how to obtain enough corn and pork for the winter, how to handle their slaves, and what supplies to send him in the field. He advises her on the children and directs the children to behave. These glimpses into the homelife of Confederate Georgia grant us a clearer understanding of how people far from the battlefields were still affected by the war.